The Palram 6 ft. x 8 ft. SkyLight Shed is ideal for storing, organizing and protecting your outdoor life. Palram SkyLight sheds were developed and built to last; they do not fracture, bend or discolour, and withstand extreme weather conditions such as hail and high temperatures. Made with Palram's virtually unbreakable Polycarbonate and reinforced aluminum frame, the SkyLight Shed will provide years of maintenance-free protection. At first you may wonder about the flexibility and thinness of the Polycarbonate panels, but rest assured that once assembled, the shed will be rigid and durable. The unique SkyLight Polycarbonate roof panels transmit natural sunlight throughout the day while having an opaque external visibility for maximum privacy. Front and back vents are included for ample airflow. Designed with your outdoor needs in mind, the SkyLight Shed will compliment your home and enhance your outdoor living space. No fighting your way to the back of the shed with our Double Door SpaceSaver. Everything is easily accessible in this functional and attractive lean-to style shed. It is perfect against a fence or up tight. BEFORE ORDERING check with your local building, zoning, and neighbourhood association to obtain all applicable permits. Elegant, impressive and strong, the Herald 2230 Door Awning will keep your entrance, door and facade dry and protected from the harsh elements. The powder coated, galvanized steel support arms, aluminum front and back trims and the virtually unbreakable, Twin-Wall 100% UV protected polycarbonate panel which also filters the harmful UV rays, make the Herald 2230 the perfect Awning. Its robust and modern design matches any home decor. The Heralds front gutter and hidden rubber gasket helps direct rain and snow off to the sides, keeping your entrance clear. This Do-It-Yourself product is made of high-end materials to ensure durability for many years of use, it includes all installation hardware. 6 ft. x 8 ft. SkyLight Storage Shed in Grey The Palram 6 ft. x 8 ft. SkyLight Shed is ideal for storing, organizing and protecting your outdoor life. Palram SkyLight sheds were developed and built to last; they do not fracture, bend or discolour, and withstand extreme weather conditions such as hail and high temperatures. Made with Palram's virtually unbreakable Polycarbonate and reinforced aluminum frame, the SkyLight Shed will provide years of maintenance-free protection. At first you may wonder about the flexibility and thinness of the Polycarbonate panels, but rest assured that once assembled, the shed will be rigid and durable. The unique SkyLight Polycarbonate roof panels transmit natural sunlight throughout the day while having an opaque external visibility for maximum privacy. Front and back vents are included for ample airflow. Designed with your outdoor needs in mind, the SkyLight Shed will compliment your home and enhance your outdoor living space. 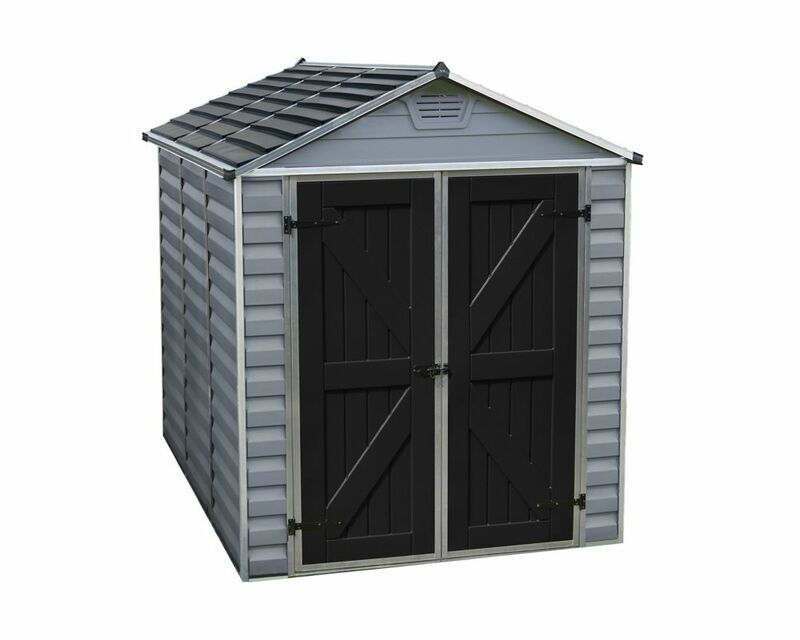 6 ft. x 8 ft. SkyLight Storage Shed in Grey is rated 3.0 out of 5 by 3. Rated 4 out of 5 by Ronn from Shed The shed is as I expected. The walls are thin but very strong as with our Palram greenhouse. Patience is needed during assembly. Rated 3 out of 5 by Rinnie from Shed Shed serves it purpose for us as storage but materials are sub par, very flimsy. We have no time to assemble this shed. &nbsp;How much will it cost to have it assembled by professional and who to contact? Hi Madz, Please call The Home Depot's services 1-800-628-0525 Thanks and have a wonderful day!